In 1773, colonial resisters protested the British tea act. In 1911, industrial workers demanded safer factory conditions. In 1913, U.S. women petitioned for the right to vote. 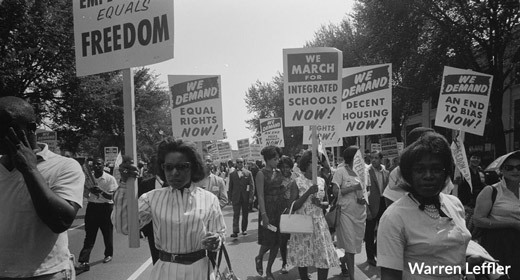 In 1963, African Americans claimed equal rights and protections under the law. Law, politics, and policy: When government is working effectively, they can help to ensure that regulations reflect society's evolving values. But when government fails to acknowledge and respond to the concerns of citizens, advocacy and activism can play a powerful role. Perhaps that's why Robin Phinney (PhD '10) and LaGina Gause (PhD '16), recent Ford School doctoral alumnae, have focused their research on ways to improve the effectiveness of these powerful drivers of change. For Phinney, the emphasis is on identifying the key characteristics shared by the most influential advocates for the poor; for Gause, the goal is boosting the power of contemporary protest. Phinney summarizes her work in a new book, Strange Bedfellows: Interest Group Coalitions, Diverse Partners, and Influence in American Social Policy, forthcoming from Cambridge University Press. Existing political science theories, she writes, can't really explain how groups with limited resources and membership bases have been effective in influencing legislators. Phinney argues that their success comes from collaboration. In general, she says, there are strong incentives for groups to carve out a niche and work by themselves. But when there's a larger threat, those natural barriers to collaboration can fall away—making it possible for diverse coalitions to advocate for shared interests collectively. That collective action, she says, multiplies their influence because each group brings diverse strengths to the table. But activism and protest can be costly, says Gause, "particularly for racial and ethnic minorities, the poor, and other resource-constrained groups." White, affluent constituents generally exert greater influence, writes Gause. But her recent research shows that legislators do respond to low-resource groups in the wake of effective protests. "The effort to fight back against a system that you feel doesn't adequately represent you is hard and frustrating," says Gause, who is completing a year-long postdoctoral fellowship at Harvard's Ash Center for Democratic Governance and Innovation. "But my work says yes, it's hard, but in some ways the harder it is, the more likely it is to be effective." Gause notes that signing an online petition or promoting a twitter hashtag—common forms of contemporary activism—tend to pale in comparison to the effects of large-scale demonstrations like the women's marches and airport protests we've seen in the first quarter of 2017. The recent airport protests, in particular, seemed powerful to Gause. "The fact that people were willing to engage in protest, and other forms of collective action, even when it wasn't their group being targeted, shows great promise."